What the heck is a Swoncho? When I first came across this term, I nearly fell off my chair laughing. I guess morphing two words together and getting a new hybrid name makes "sweater poncho" easier to remember. Personally, I had to Google the word, finally got an image and had an AHA moment when I realized what the term meant. 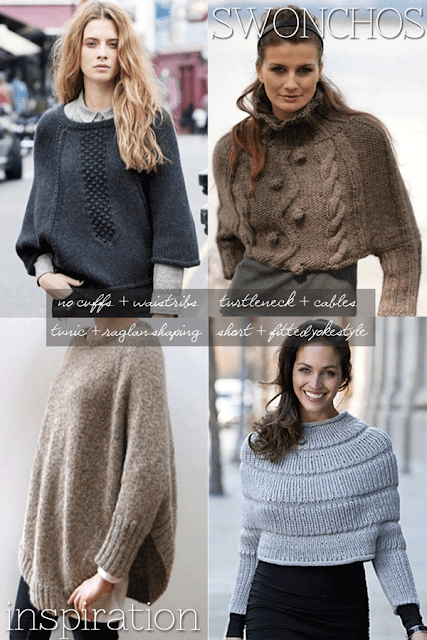 You can see from the examples above that there are many kinds of sweater ponchos. Some are really capelets with sleeves. The raglan shaping in the top left one is very attractive and leaving the sleeves without cuffs makes it easier to layer underneath. Tunic length would be my preference as it looks to be cosy and easy to wear instead of a jacket when it is cool. Read further and get a free pattern for a tunic length sweater poncho.